“This is called gambling,” Air Force Gen. Paul Selva said on Tuesday. Because the military is about to go into the fifth month of the fiscal year under a continuing resolution that prevents new program starts and limits spending to the previous year’s levels, “we don’t actually know the impact the CR will have on FY ’19 until an ’18 budget is actually passed,” Selva told reporters on Tuesday at a Defense Writers Group breakfast. Last spring, when the Pentagon did not receive its FY 2017 budget until May, then-acting Pentagon comptroller John Roth told reporters that operations and maintenance funding was particularly tough to execute when a defense spending plan is approved by Congress so late in the year because O&M funding expires at the end of that fiscal year. Procurement and research dollars can be used into future fiscal years, but spending for training, routine maintenance, depot availabilities and more is either rushed in the back half of the fiscal year or results in the lost opportunities to which Selva referred. Selva would not provide any details on what would be in the 2019 budget request, but said it would focus on responding to the “great power competition” the United States faces with Russia and China. The budget also would deal with requirements set out in the nuclear posture review, which is expected to be released Feb. 2, and the ballistic missile defense review, which should come several weeks later, he said. Selva said the recently released national security and national defense strategies highlighted that competition, which he said should have been acknowledged 10 years ago. The last 10 years have shown that “China is ascendant, and Russia is accumulating wealth and influence across the Asian and European continent. And the United States is engaged with both.” There are “friction points” between the three powers as they compete on economic, political and national security stages, he said. Despite some claims that the nuclear review sets dangerous new reasons for possible use of nuclear weapons, Selva said it is “very consistent” with previous nuclear doctrine. He denied that the review advocates a nuclear response to a serious cyber attack, as some reports have claimed. He said the review added one sentence that “clarified” that severe damage to the national command and control system could be a factor in a decision to go nuclear. Selva also dismissed the published worries about the mention of low-yield nuclear weapons, noting that lower-yield warheads have been in the nuclear arsenal for decades. The mention of lower-yield weapons was meant to “raise the threshold” for a nuclear response by warning an adversary they could not expect to escape a nuclear response to use of a small nuclear weapon. “Russia and China, in the past decade, have been building new (nuclear) delivery systems. We have not. Russia and China have been getting better, we’ve been staying the same,” he said. 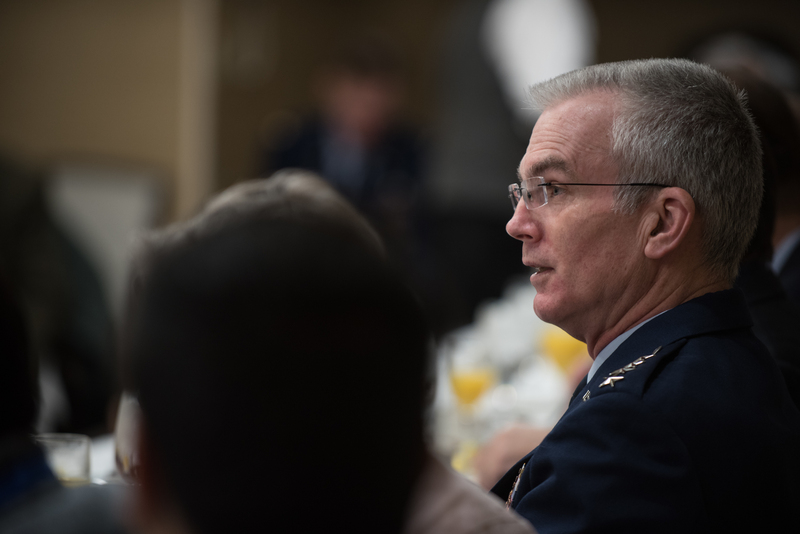 The Nuclear Posture Review confirms the need for the nuclear deterrence triad and lays out plans for its modernization, including a new bomber, new intercontinental missiles and the Columbia-class ballistic missile submarines, Selva said.